Inventory We are a resale marketplace, not a box office or venue. Ticket prices may exceed face value. This site is not owned by Broward Center . The Broward Center for the Performing Arts is a large multi-venue theater and entertainment complex located in the heart of downtown Fort Lauderdale, Florida, USA. Opened in 1991 on a 5.5-acre site along the north bank of the New River at Sailboat Bend, the center became a catalyst for major downtown revitalization efforts and an anchor of the Riverwalk Arts and Entertainment District. Designed by award-winning architect Benjamin C. Thompson, the Broward Center is considered the cultural heart of Broward County. 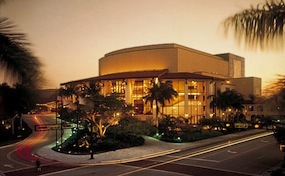 Hosting operas, ballets, concerts, plays, lectures and numerous community events in its four theaters, Broward Center is partners in the arts with several renowned organizations including the Symphony of the Americas, Florida Grand Opera, Miami City Ballet, Concert Association of Florida, Gold Coast Jazz. National tours of Broadway productions are presented in partnership with Broadway Across America. Broward Center's mission includes a strong focus on integrating the arts into education and a substantial portion of annual programming is dedicated to educational and community endeavors. CenterFortLauderdale.com is a privately owned and operated company that concentrates solely in the online resale of all tickets in the secondary market. We are not currently affiliated with any official website, venue, and or box office. Ticket prices on our sites may fluctuate well above or below face value and can change quickly with market conditions. To order tickets for all Au Rene Theater Broward Performing Arts Center Fort Lauderdale events please follow the steps online through the checkout or pick up your phone and dial our operators at anytime.